In 12-inch skillet, cook bacon over medium heat, stirring occasionally, until almost crisp. Stir in turkey, carrots, onion and celery. Cook about 2 minutes, stirring frequently, until turkey is brown. Spoon turkey mixture into 3- to 4-quart slow cooker. Stir in remaining ingredients. 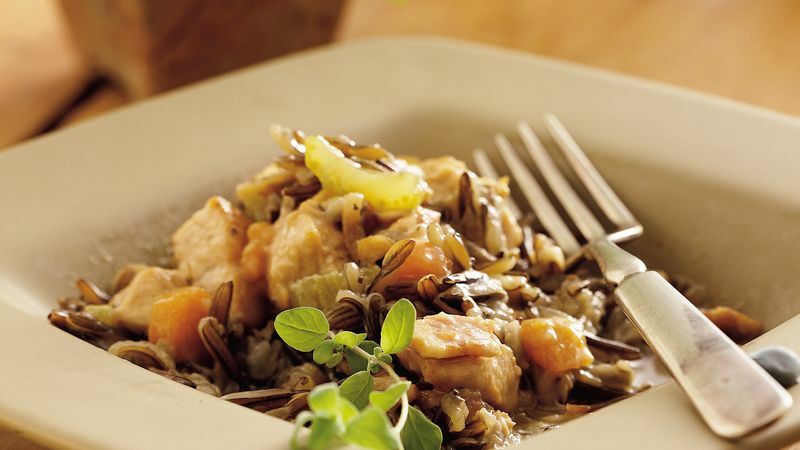 Wild rice is native to the northern Great Lakes, but also grown in the Midwest and in California. Wild rice has a wonderful nutty flavor and chewy texture that enhances casseroles, soups, stuffings and salads.